Robin Tiger Williams is set to play at the British Masters tomorrow. Robin Tiger Williams in action. IN SPORTS, FANS and media alike are often looking for the next big thing. Well, this weekend, golf could witness the next great of the game. Robin Tiger Williams, who is still just 16-years-old, will make his professional debut at the British Masters on Thursday. That’s the same tournament that launched Rory McIlroy’s career. Tiger Williams says he got his name when Tiger Woods won the 2001 Masters. The achievement meant Woods held all of golf’s major tournaments (the US Masters, the US Open, the Open, and the PGA Championship), at the same time — the first golfer ever to do so. “I was born the year Woods completed the Tiger Slam,” Tiger Williams told The Telegraph. He is now the top-ranked junior golfer in Europe and was the youngest-ever winner of the Future Champions Golf World Championship. 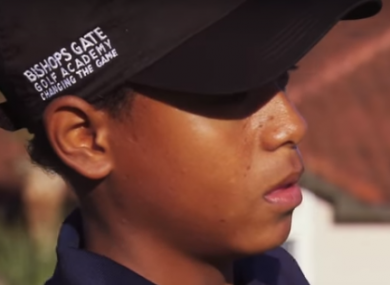 This week, the British teenager — who is originally from South Africa — finds himself competing alongside three former world number ones in Martin Kaymer, Lee Westwood, and McIlroy. Williams wears Nike gear and even created his own logo with the words “Robin Tiger,” but said he can’t hit as far as his hero. Email “A 16-year-old golfer named Tiger is about to make his professional debut”. Feedback on “A 16-year-old golfer named Tiger is about to make his professional debut”.